Please fill in the short form below with your question, either about the Simrad Broadband 3G Radar, or for some technical advice. Please include details of your vessel if you feel they will help us answer your query. Utilising solid state technology the broadband radar solutions from Simrad provide superior target detection and separation, ease of operation and a new level of navigational safety to a wide range of boats. The Broadband 3G radar builds on the excellent close range performance of the original Broadband radome the BR24 by offering impressive target detection and clarity of image. The Broadband 3G Radar also offers a massive 30% increase in range over the BR24. Solid state technology produces an immediate, accurate on screen image unlike normal warm-up times associated with magnetron. Very little power is required making the broadband radar ideal for all types and sizes of boats, including recreational vessels. The safest of all radar, it can be mounted anywhere. Broadband Radar has fewer emissions than a mobile phone. No reason to open the dome, no tune or zero mile adjustment. Miss none of your immediate surroundings. Fantastic for light manoeuvres in marinas or in conditions of limited visibility. 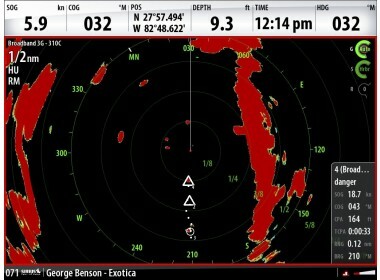 Proven Auto Harbour and Off shore modes completely optimise the radar image - even on the shortest range of 200 feet. When used in conjunction with a heading sensor you can track up to 10 targets. Set up guard zones and protect yourself from more angles. Select 36rpm for almost instant updating at less than 1nm. 30% more range than the original BR-24 Broadband Radar and Zero main bang. 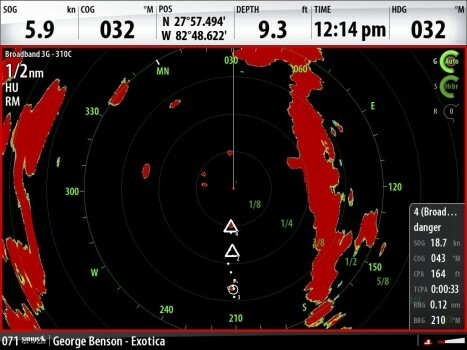 Connect to a Simrad NSS, NSE or NSE with ease. Traditional radars use high-powered magnetrons to generate microwave signals with very short pulses of applied voltage. Now a radar which takes advantage of solid-state X-band radar technology, which utilizes FMCW techniques. 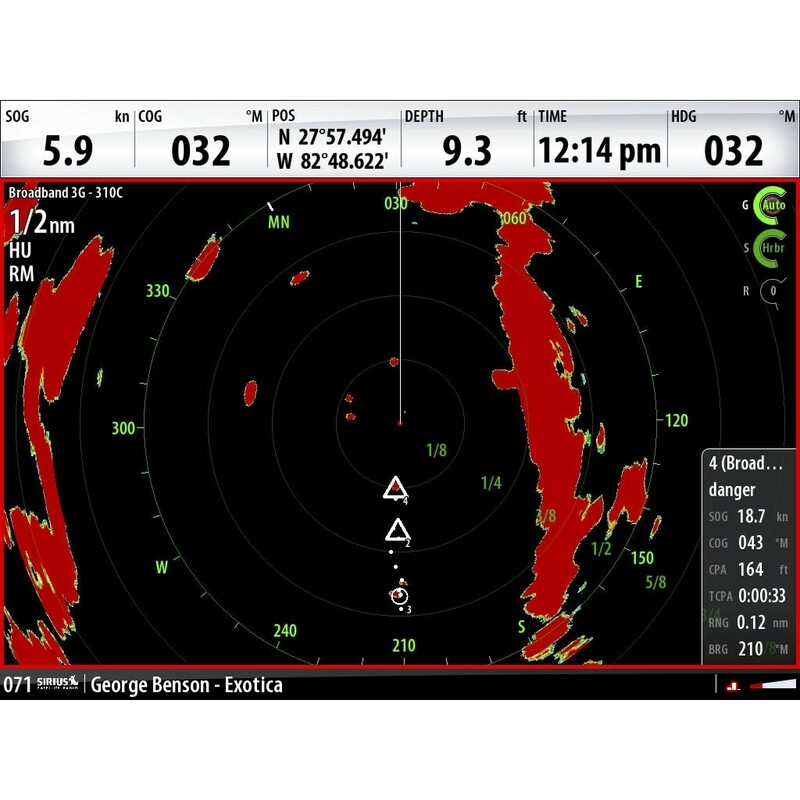 The Simrad Broadband Radar sends a continuous transmission wave with linear increasing frequency (hence the term Broadband). The wave retains its frequency as it travels out and reflects back from any objects. Meanwhile, the transmitter continues to output an increasing frequency. The difference between the currently transmitted and received frequencies, coupled with the known rate of frequency increase. Since FMCW constantly builds up radar return energy (versus single pulse), this system provides target detection superior to pulse radars while transmitting at far lower energy levels.